Today Christians the world over celebrate Christmas - Christ's birth. Christmas marks a moment to reflect and believe in the possibilities of rebirth and renewal. Christ's birth in Bethlehem, more than 2000 years ago, continues to represent a strong symbol of hope in a better future. It is fitting, therefore, that I reveal the new Spring/Summer 2011 collection today (one carré at a time) for the new designs surely symbolize a new beginning. And while most beginnings come about as a reaction to an event (or an artist current) of the past, I thought it more appropriate to introduce the new collection with a design that embraces the Maison's rich artistic patrimony. Today's scarf is a reinterpretation of a 1957 design that, needless to say, proved highly popular with admirers and collectors of Hermes scarves alike: "Brides de gala en finesse". 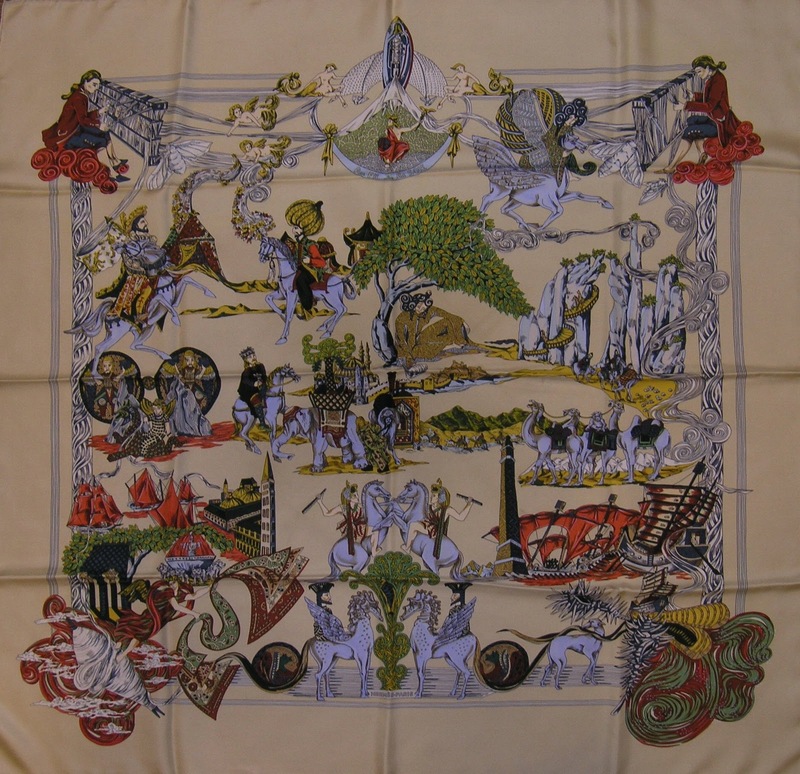 The "core" of the scarf design, the two bridles placed next to each other as if the horses sporting them walk in tandem but "look" away from each other, are now juxtaposed on a background depicting a fantastic creation. This background design reminds me of the lush hair of a fairytale princess from a storybook of my childhood, one that invites the reader to follow the individual hairlocks as if wandering on an unknown path, fully prepared - not as much to get "lost" but to discover just what such wanderings are about to reveal. At first, I believed the background pattern had been computer-generated (it reminded me of the organic patterns that artists of computer programming can obtain by applying the Fibonacci series). A quick exchange with Florence, the gifted artist whose creation we are savouring in this post, revealed a design drawn painstakingly by hand. I encourage you to become an explorer yourself by visiting Florence's site (http://www.florencemanlik.com/) to get a complete appreciation for her creativity. This very background embues a unique sophistication into the overall design, making the scarf much more feminine than its more simple predecessor, and thanks to the curves, both more gracious and more mysterious. When tied, this scarf shows truly beautifully, instilling a sense of contemporary flair to this classic and an additional layer of sophistication for the person sporting it. The colours of this design are somewhat pastel, with a beautiful green, orange (depicted above) and indigo (below) as the most impactful for me, although each one charms in its own way. As the last thought for today, allow me to seize this opportunity to wish you a very merry Christmas, and a safe and happy holiday season ! One of the most spectacular designs, despite its apparent simplicity, is "brise de charm" ("charming breeze"), a scarf depicting various fans beautifully decorated with horse scenes, birds, a lady's portrait and also floral patterns. Recently I was thinking of my travels to far-away countries (such as Japan) and so I thought of the fan, this simple invention that became all-too-practical in the context of hot climates (in contrast to the heavy snow falls this winter, we need reasons to dream). 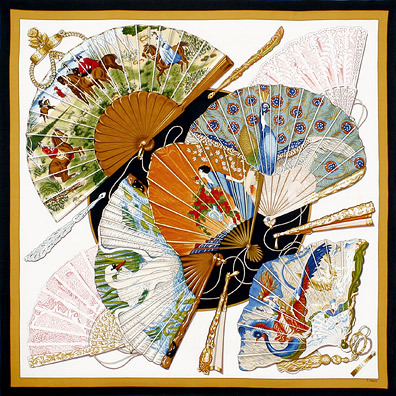 The fan's delicate make and the skillful drawings on it render it an objet d'art, feminine by excellence, that never fails to inspire. For my Birthday I got treated with something as spectacular as the Hermes silk scarves: a cologne named "Poivre Samarcande", part of the Hermessence collection. So I'd like to seize this opportunity not only to express my excitement, but also to reflect on the distances that merchants continue to cover in their relentless drive to bring customers the best the world has to offer. The story of the "Poivre Samarcande" ("Samarcand Pepper") is equally fascinating and stirring. Samarkand is a city in Uzbekistan that provided the spice traders with a place to rest before continuing their long journeys to seek and acquire spices - hence, the city's location along the spice road made it well known. The peppery scent captured in the fragrance is thus both a reference and a tribute to the place that became so critical in the history of humanity. While the scarf is also a tribute to the silk road, "Au fil de la soie" ("on the silk thread") reminded me of the journeys undertaken by so many merchants, traders and curious alike, who - unbeknownst to them - were such an integral part of the world's - and humankind's - history. 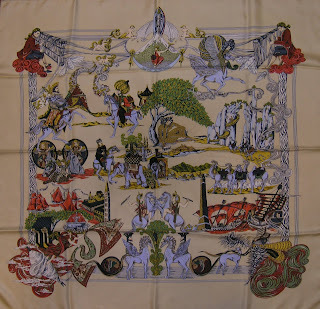 The scarf depicts several scenes associated with the silk trade - of harvesting the silk, of transporting it, of processing it, and finally of turning it into spectacular elements of clothing, so delicate, so luxurious and so refined. A great design, launched in 1995, by one of the most admired and prolific designers - Annie Faivre. Just as the fragrance name carries my mind and my imagination to the spice trade and long road the spices travel to us, so is this scarf makes me reflect on the long journey of the silk, meant to be admired, enjoyed and treasured by a privileged few. I am absolutely ecstatic to say that I managed to acquire tickets to the Mariinsky Ballet troupe's performance of the Swan Lake, scheduled for the beginning of March 2011 in Toronto (this is a treat I allowed myself for my upcoming birthday). The Mariinsky Ballet is a classic ballet company company based at the Mariinsky Theatre in Saint-Petersburg, Russia. Founded in the 18th century and originally known as the Imperial Russian Ballet, the Mariinsky Ballet is one of the world's leading ballet companies. Internationally, the Mariinsky Ballet is most commonly known by its former Soviet name the Kirov Ballet, a title which is still used by the company when touring. So you can imagine my excitement at the prospect of seeing the leading ballet company in the world in Toronto. While "Les Ballets Russes" ("Russian Ballets") is a tribute to the artistic grace that this specific troupe elevated to the level of sublime through their performances (the best known dancer was Anna Pavlova, renowned the world over). 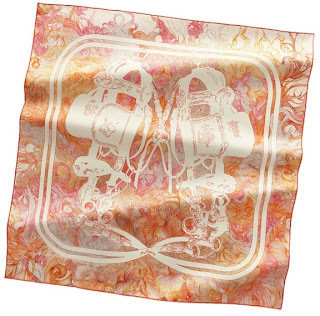 So I couldn't think of a better scarf design to express my own enthusiasm and pay tribute, in my own modest way, to the joy that ballet, as an art form, brings me. 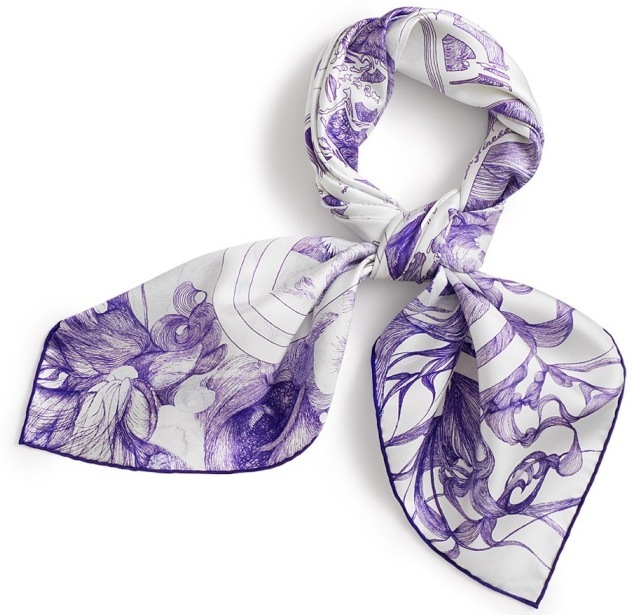 It is a spectacular scarf, rich in meaning and - delightfully - energetic. It manages to capture our imagination in a very harmonious way, captivating us with the stories the dancers are conveying strictly through body movement. Indeed, graceful would be the only way to describe their art of communication. 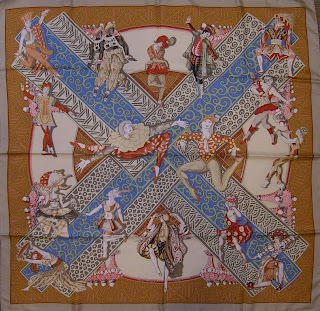 This scarf ties truly wonderfully, and is a joy to wear for anyone with an appreciation for dancers, in general, and ballet performers, in particular.